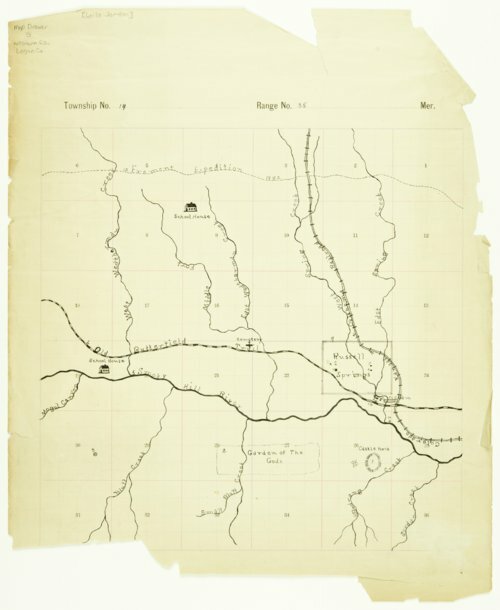 A map drawn by Leila (Jordan) Teague showing Township 13 South, Range 35 West (part of Russell Springs Township) and includes Castle Rock, the Smoky Hill River, the Butterfield Trail, and the town of Russell Springs. This is one of several maps drawn by school children for a contest organized by Judge J. C. Ruppenthal of Russell, Kansas. The maps were to meet a "requirement of presenting historical data, together with excellence and accuracy of drawing." People - Notable Kansans - Ruppenthal, J.C.